Yesterday afternoon, my husband was commenting on the fact that he and I have much to be thankful for, and we do. In addition to each other (a better deal for me than for him, no doubt! ), we have our health; happy and healthy family members; and we also enjoy many spiritual, emotional, and even material blessings. I thought about this when I was decorating the tea trolley for fall over the weekend. I don't imagine every woman in the world can reach into closets and shelves and pull out tea accoutrements for every season of the year. And I'm thankful for mine! The eye-catching embroidered tablecloth is something I won on Bernideen's blog many years ago, and I think it's just as beautiful as I did back when I won it. 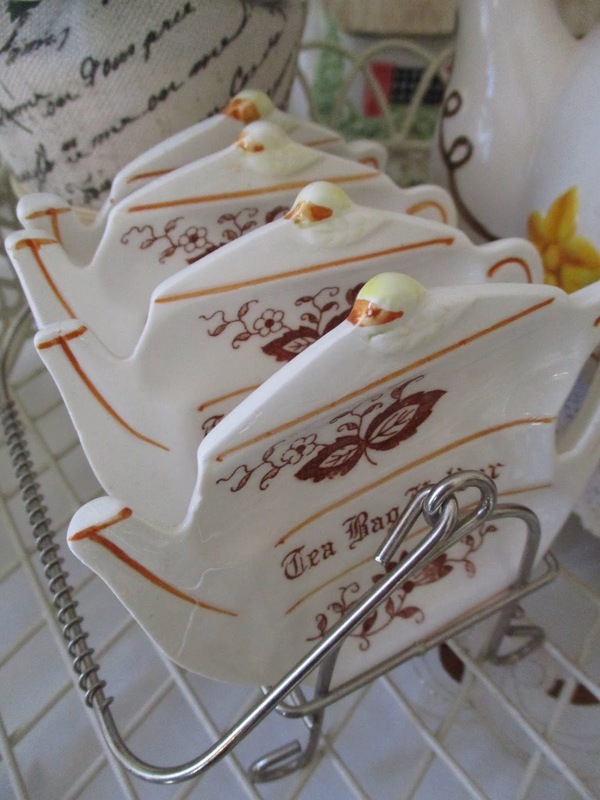 The tea bag holders were an antique mall find years ago. 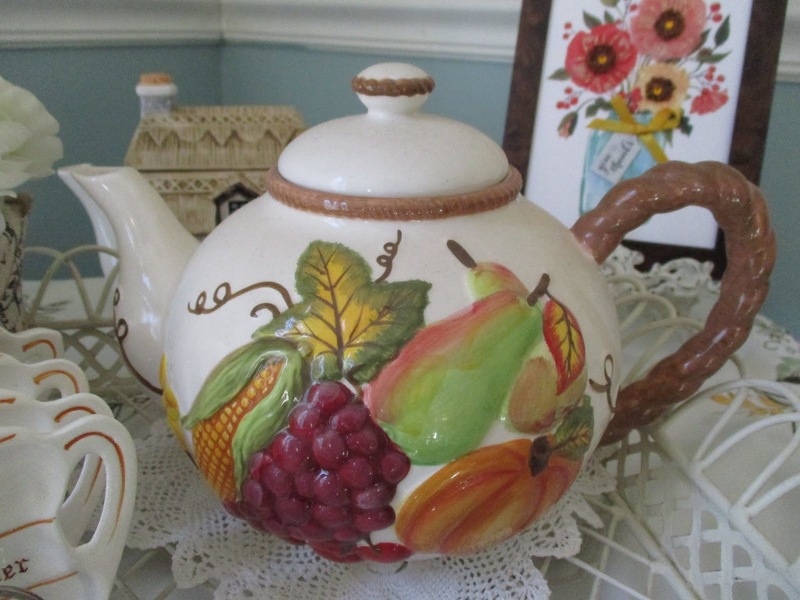 The teapot was part of the Bernideen bonanza I won. I love it! And this "give thanks" art is actually a Papyrus card I bought on our recent trip to Wisconsin. 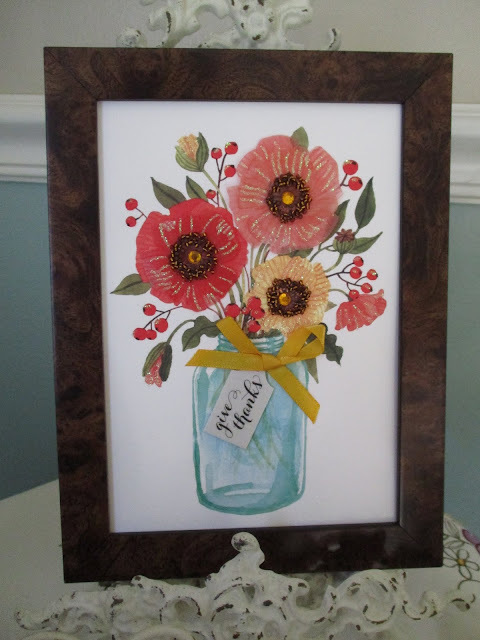 I realized I could place it in a frame without glass so that the fabric details would show (and use the card more than once). Because I bought it on a trip, the card also reminds me that I occasionally get to travel, and I'm thankful for that too. I have been tempted to fast-forward to Christmas this year, but thinking about "giving thanks" has made me slow down and savor the holidays in their proper order. So what are you thankful for? I love your tablecloth. I am thankful for my husband and friends who support me in all my crazy parties and endeavors. 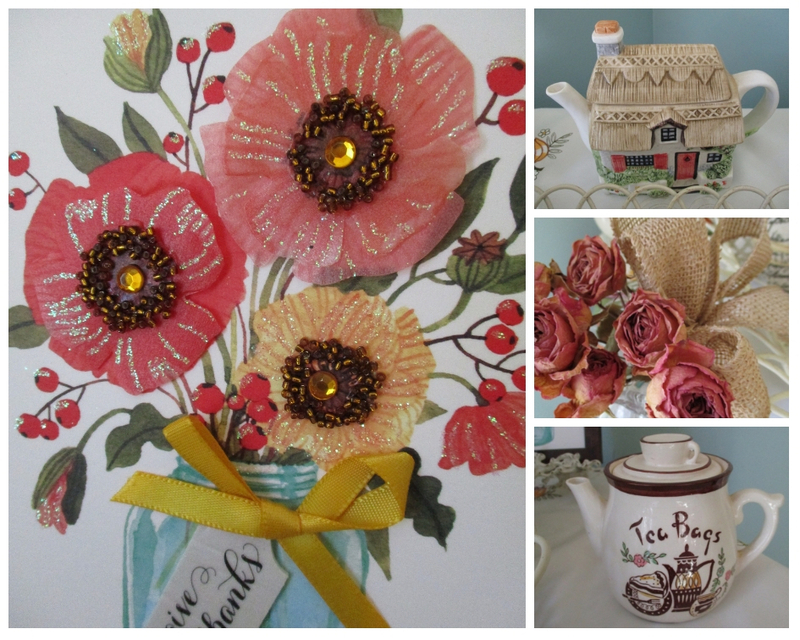 Your tea cart is lovely, as always, and what a nice reminder of things to be thankful for. I always enjoy seeing how you decorate your tea cart, but this one was especially lovely, and you reminded me to stop and consider all the things I have to be thankful for. Such a beautifully-arranged tea cart! I really like the special container for tea bags--I've never seen anything like that before. This time of year definitely makes me remember to be thankful for family, friends, health, and a comfortable place to live. What a nice post. 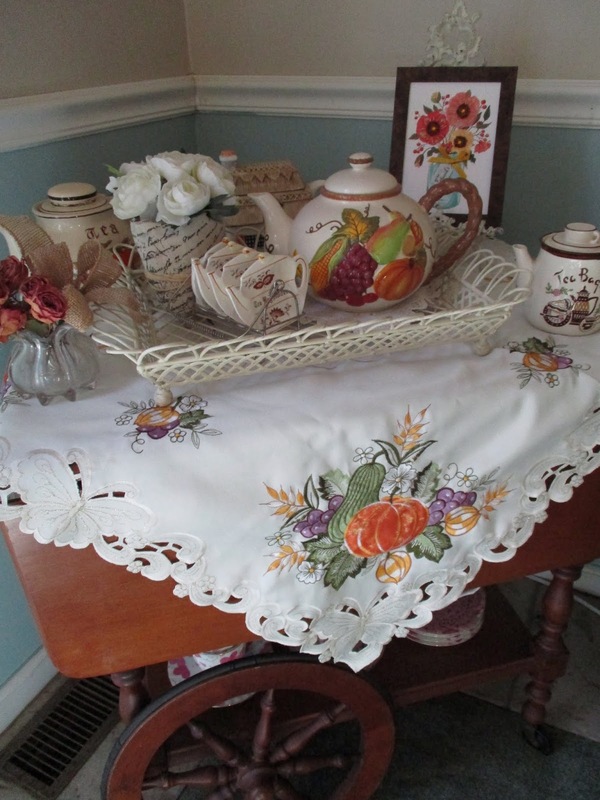 I love that the tablecloth and teapot go together so beautifully and are both from Bernideen.